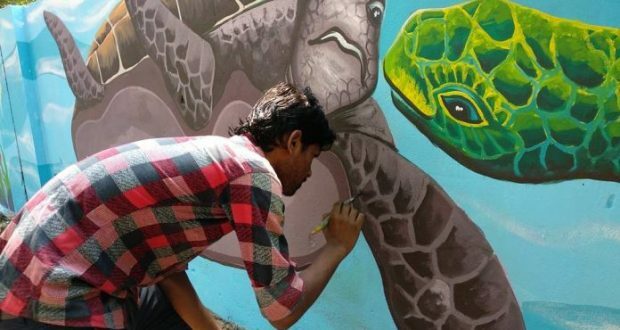 Bhubaneswar: 25/10/18:The white washed walls along some of the major stretches across the city are all set for a colourful look with mural paintings based on the World Cup Hockey. The civic body has already identified a 40-km road network for work related to wall paintings, murals and street art. This was decided after a survey by BMC for carrying out the subject work to ascertain the feasible point where the work can be carried out. BMC has decided to adopt a two-stage process for award of work. The artists and the groups allotted various stretched include: Bakul Foundation, Gopal Krushna Rath, Satyabhama Majhi, Virtu Communications, Pinaki Ranjan Mohanty, Rashmi Ranjan Jena, Krutika, Mastermind, Brushing Point and Odisha Modern Art Gallery. The major stretches are flyovers from Vani Vihar to Jaydev Vihar, Airport to Jaydev Vihar, Governor’s House to Fire Station via Delta Square and Siripur Square to Fire Station Square. The themes of the various artists would, however, vary with the central theme revolving around hockey and Odisha’s contribution to the game.